These purple, fuschia teal and gold Mermaid birthday invites are the PERFECT addition to celebrate YOUR little mermaid’s birthday. Best of all, they are an INSTANT DIGITAL download, that you can edit and print as many as you like- T O D A Y! Easy Breezy. I M A K E Y O U L O O K G O O D ! I know EXACTLY how busy you are being awesome; THAT is why I have taken out all of the stress of coordinating and styling your event so you can get to the fun part; THE PARTY (and especially the CAKE). L I V E I N Y O U R W O R L D ; P A R T Y I N O U R S ! 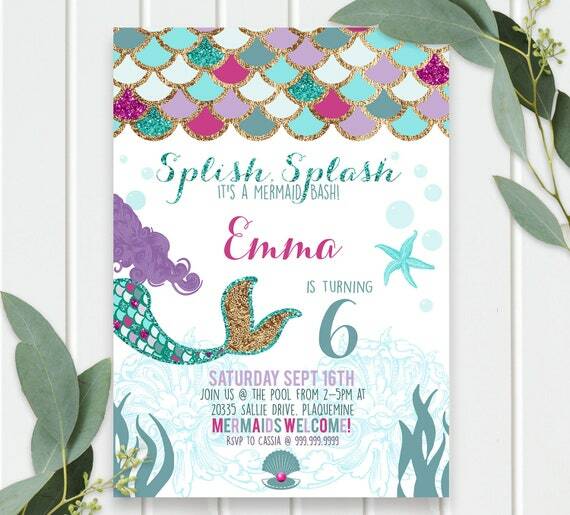 ○ MERMAID printable invitations, with matching backside (+ FREE matching bonus “Thank you cards” are also included). A COMPLETE LIST of the designs included in your purchase is listed below in the section titled: “THIS FILE INCLUDES”. You will be able to easily customize the text in these templates to make your celebration completely personal. All of the fonts and formatting stay the same. ○ DETAILED INSTRUCTIONS, INCLUDING A VIDEO TUTORIAL so that even if you don’t know a thing about tech, you will look and feel like a total pro! IT IS IMPORTANT TO NOTE that you WILL NOT be able to edit from a tablet or a phone. If that is all you have access to, simply add the “EDIT MY ORDER” and I will edit it for you. ○ Any frames, table holders, flowers, and accessories are not included. ○ Following the instructions, make all your changes to the template and save. ○ Print at home, copy center or an online printer. ○ NOTE: You can also access your downloadable files by clicking on the “You” tab in the top right corner of your etsy screen, then select “PURCHASES AND REVIEWS” and there you’ll see your files from me ready to download. Just be sure to download ALL of them and you’ll be golden. ○ This template WILL NOT work on a tablet or mobile device. ○ Unless otherwise stated, all invitations are formatted to 5x7 in, OR 7X5 in respectively, and PDF designs are intended to print on bright white stock, 8.5in x 11in, or A4 paper. ○ As a general rule, DO NOT select “scale to fit” during printing. ○ This listing is for the design file only. Items do not include color or design changes, layout changes, or cropping of the template. If you have special requests, CONVO ME to see if I can accommodate for a small fee. ○ NO physical product is being shipped. It is a digital downloadable file with the rights to print as many as you need for your own personal use. ○ Anything Else You Need! ○ Backside Design for double-sided printing if desired. ○ A single 5 in x 7 in invitation pdf that you can use to quickly convert to a jpg so you can upload your file to print at a photo center, or send digitally via social media, Evite, text or other online services. Simple instructions included. I work MON-FRI and occasionally on Saturdays. I do my best to respond within 6-24 hours MON-FRI. If there's a large volume of emails, or if troubleshooting is required, a reply can take longer. Please be patient with me; I always make it worth it! See what my customers are creating or share your final product using #invitedbycass on Instagram! Due to the nature of this product, digital downloads are not eligible for refunds. All sales for delivered files are final. Kindly message me to seek any clarification - I am very convo friendly and can help you 100% of the way. Just see all of my glowing reviews if you have any hesitation. I aim to please! © Copyright 2018 of Invited by Cass LLC.